University of Ulster students will be hosting a Fashion Night in the Hudson Bar, Gresham Street, Belfast, on Wednesday evening (February 20) from 6 – 9pm. It’s just one of more than 50 fun events, across all four campuses, organised by the University's Students’ Union to raise cash for charity during this year’s Rag Week, which runs until Friday, February 22. For an entrance fee of only £2, Fashion Night guests will have the chance to purchase male and female vintage items and accessories, provided by Oxfam Vintage, on Castle Street. All proceeds from clothing sales will go to Oxfam and the £2 entry fee will be donated to this year’s chosen RAG charities. 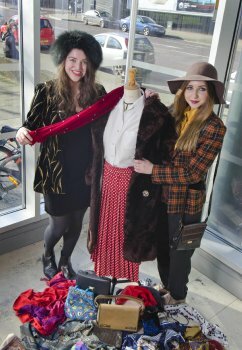 Fashion Night organiser and President of the University of Ulster Fashion & Textiles Society, Terri McStraw, said: "The aim of the evening is to combine raising money for good causes with giving students the opportunity to purchase high quality, vintage fashion at affordable prices." Ulster Student’s Union Volunteer & Societies Coordinator,BreandÃ¡nKearney said: "There has been a really positive and professional attitude to what UUSU RAG represents this year among students, University staff and the causes they are championing. "With activities lined up such as pub quizzes, RAG Olympics, 'wax, shave or dye', busking, rowing challenges, dodge ball and paddleboat tournaments, gaming days and twister competitions, I am confident that our fantastic students will meet the targets that they have set to raise money for their very worthwhile causes. "I am even more confident that they will have a great time doing it." Ulster Students’ Union President, President Claire Flanagan added: "RAG Week is a great opportunity for our students to give back to local, national and even international charities who do so much good work by raising money to support them. "RAG helps illustrate that students aren't just preoccupied with their studies and partying, but can actively organise and run events and activities for some amazing causes. "There's a brilliant feeling on campus at the minute because all the 'Raising And Giving' activities and events have created a great buzz - I'd encourage all students to get involved, give generously and of course, have fun." Jordanstown: Barnardos, Clic Sargent and Meningitis Trust.